We are in the midst of house project stuff again, and time is incredibly short on the crafting end. I am terribly exhausted, and we’ve got this week and next to keep working. So, things may be scarce from me. But, this happened last night. Miss Bug finally took up knitting. I really didn’t think it would take as strongly as it did, but she’s spectacularly addicted. Now she says things like “Just let me finish this row!” And “When I wake up in the morning I am going to come downstairs to knit with you” and she has already decided she wants to join a knitting group, and intends to take her knitting to school to do at recess. She spent all evening knitting. She doesn’t knit sitting down very much, instead she puts the ball of yarn in her pocket and wanders around the house while knitting. It all started at school, she paid $5 for kitchen cotton and a pair of her own needles. A dishcloth was cast on for her, a row was knit, and then the teacher, knowing I was a knitter, sent her home and said “Go ask your mom.” I worried she’d get frustrated, but it’s like her hands just naturally do these actions. There’s only one huge difference. She’s an english style knitter whereas I knit continental. I hope she sticks with it. She’s a child always in motion, and I can imagine that knitting may temper some of that. Give her body motion with a purpose. how exciting! I love that she wanders around with her knitting. 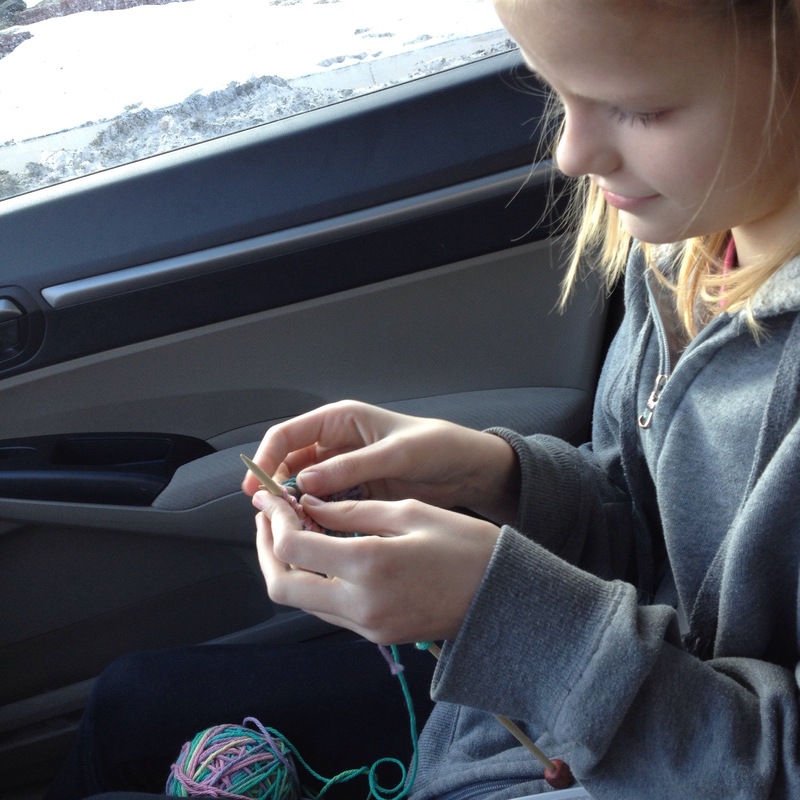 I have a very active niece who started knitting a year or two ago, and it is the only time she sits anything like remotely still – and she is very proud to be able to sit and knit when we gather for knitting days. Aren’t little knitters great? Oh my this melts my heart! That’s awesome!!!! It’s so rewarding seeing your child develop a love for something they can use their whole life!